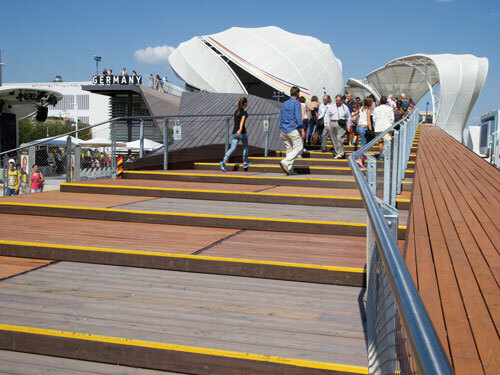 A highlight at Expo Milano 2015 was Germany's pavilion, its dramatic multi-level structure eclipsed only by the imaginative exhibits inside. The pavilion itself was designed to evoke Germany’s pastoral landscape as a Field of Ideas’, encouraging visitors to engage with each thematically organised media presentation, and at the same time to consider the solutions ordered for sustainable human nutrition in the future. Panasonic played an integral part in the technical execution of these interactive exhibits, starting with the seven 1-Chil DLP™ LED/Laser PT-RZ470 projectors which delivered on-screen instruction to visitors ahead of their tour through the pavilion. Patrons were issues with a ‘seedboard’, which unlocked extra multimedia information as 19 ceiling-mounted 1-Chip DLP™ PT-DZ570 projectors automatically beamed video into the paper surfaces. A further three dual-lamp 1-Chip DLP™ PT-DZ680 projectors displayed imagers inside regular rain umbrellas – a remarkable feat - and inside video domes.